Like most women, I am no stranger to counting calories and limiting the amount I eat each day in order to lose or maintain weight goals. When returning to the low-protein PKU diet in January 2013, consuming a higher amount of calories was definitely a major concern of mine. In fact, I would say that calories – more so than taste – was a key decision factor for when selecting a formula. Let’s face it, when you’re drinking formula three and four times a day, those calories can rack-up fast! But all that had to change after finding out I was pregnant. I suspect that because of the old adage, “when you’re pregnant, you’re eating for two,” most pregnant women do not have any trouble meeting those calorie goals. But if you have PKU, and are challenged with a low-phe tolerance, meeting those goals can seem next to impossible. Yet, doing so is just as critical as making sure you limit your protein intake. If you do not consume enough calories, your body can enter what’s known as a catabolic state. It’s a big concern for those in the bodybuilding industry because without adequate post-workout nutrition (a.k.a. a protein shake), bodybuilders are at risk for excessive breakdown of muscle mass and could thereby end up throwing all their years of hard training down the drain. While counterproductive for fitness gurus, this catabolic phenomenon can be downright dangerous for someone with PKU. That is because when you’re not getting enough calories your body tries to compensate by breaking down muscle for energy. And since muscles are comprised of protein, blood phenylalanine levels will increase as a result – this despite the fact you may be strictly adhering to a low-protein diet. As you can imagine, this could also have grave implications for maternal PKU since phe levels are doubled when crossing the placenta. Switch to a higher calorie formula – As soon as I found out I was pregnant, I made the decision to switch to a formula higher in calories. I’m currently taking four, 50 gm servings of Phenex-2 per day, which accounts for 820 of my daily caloric intake. Create a stash of low-phe/high-calorie snack options – My favorites are Welch’s Fruit Snacks (0 mg/80 calories per 0.9 oz. packet), Rice Krispies Treats (26 mg/90 calories per bar) and Little Debbie Zebra Cakes (38 mg/161 calories per cake). Adding Biscoff European Cookie Spread (25 mg/90 calories per tablespoon) to low-protein raisin bread or apple slices is another great way to increase those calories. Though not really a snack option, making pancakes using the Cambrooke Foods MixQuick product is another great way to front-load your day with a high-calorie breakfast. I usually half the serving size, which still comes out to 200 calories. Always pack snacks – Make sure to also carry some snack options in your purse, car or backpack. This will help prevent you from being hungry while stranded without food options. Take the time to figure out the calories/per serving of your favorite low-protein recipes – In order to have the most accurate picture of how many calories you still need, be sure to take the time to figure out the calorie equivalents of each recipe ingredient. I was particularly challenged with this when eating my favorite Cook for Love recipes. Thankfully, with the recent launch of the How Much Phe website, this process is not nearly as painful. If you haven’t subscribed to the site as of yet, I highly recommend it – especially if you’re pregnant with PKU. Replenish what your burn – Lastly, don’t forget that if you exercise, you’ll need to eat more than what your PKU dietician has recommended. Tracking calories burned during exercise is not an exact science, but I have found that mobile apps like My Fitness Pal and RunKeeper can be very helpful in providing an approximate calorie deficit count. My Fitness Pal can be used as an electronic food diary but unfortunately it isn’t all that convenient for those on the low-protein diet. However, I’m still able to use the app in a limited fashion by setting up a user profile that tracks my current weight, sedentary lifestyle, and estimates how many calories burned after completing a workout. RunKeeper is another calorie tracking app that uses GPS to track run/walk distances and then estimate the number of calories burned. I use both on a regular basis and have found that RunKeeper is great for cardio and My Fitness Pal is good for other exercise options like weight lifting and prenatal yoga. I should also say that I haven’t taken this as a free pass to eat whatever I want. If I notice at the end of the night that I’ve already met my calorie goal, but still need some phe, I’ll opt for some yogurt or other low-calorie option to meet that goal without going overboard on the high-sugar, high-calorie options. Fall is here and in the Merrifield household, that also means football! As a Pittsburgh-native and a University of Tennessee graduate, my college/NFL loyalties are split between the Tennessee Volunteers and the Pittsburgh Steelers. Even though we may not always win, getting everyone together for good food and drink is always a plus. So with this being the first football season during which I am following the low-protein diet, my husband and I have been brainstorming a few PKU-friendly party foods. 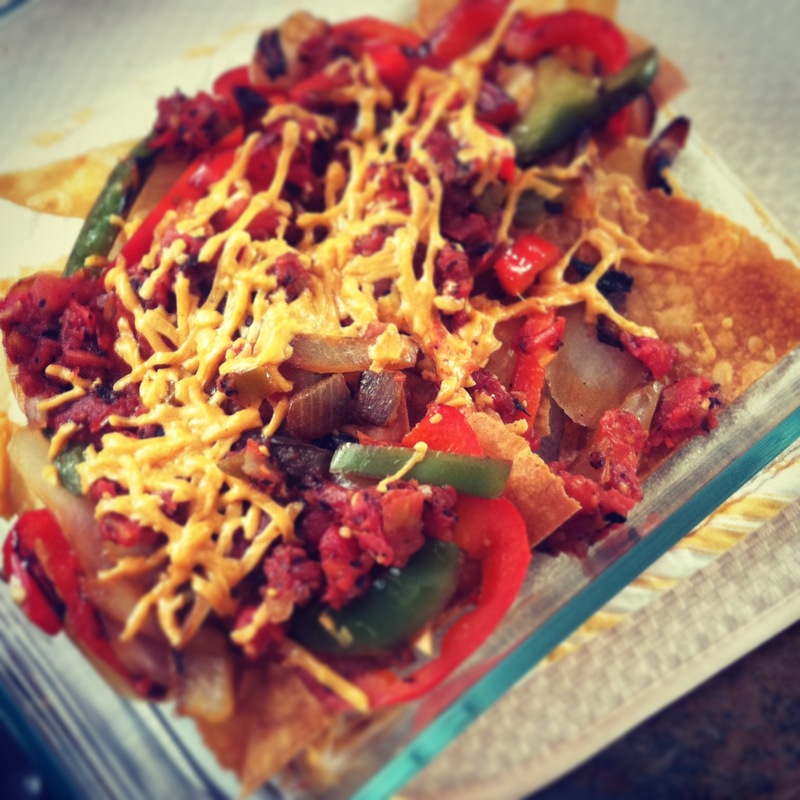 Here’s a recipe for low-protein nachos recently concocted by my armature chef hubby. To make tortilla chips from the wraps, follow the directions on Cambrooke Foods’ website. Their recipe calls for six wraps, but for the purpose of this dish, I used two. If you wanted to make a larger serving, you could easily increase the number of wraps. While the tortilla chips are cooking, sauté the peppers in the canola oil until slightly browned and tender. Since my husband was making his own high-protein version of nachos, he browned his ground beef in a separate dish and planned to split the peppers between the two of us. Once the chips have been pan-fried and cooled on a paper towel, place them in an oven-safe dish, zero-out their weight on gram scale, and top with 115 grams of peppers. Zero-out the scale again and add 85 grams of the salsa style canned tomatoes. Top the nachos with a ¼ cup of the dairy-free cheddar shreds from Daiya Foods and place in the oven. Broil until the cheese has melted, remove and serve. Careful because the dish will be very hot! Feel free to experiment too! Add onions or olives if you like. You can also top the nachos with shredded lettuce, or if you have a bit more tolerance in phe, add a serving of guacamole. The 100-calorie snack-packs from Wholly Guacamole are perfect for one-time servings. Enjoy! 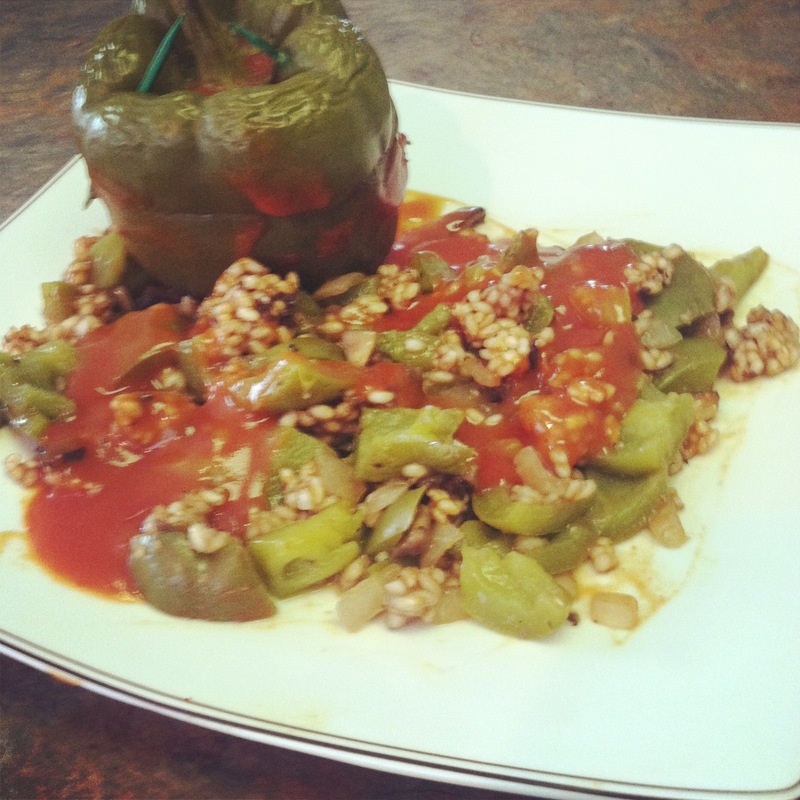 One of my favorite dishes that my mother would make when I was off-diet was stuffed peppers. Her original recipe called for mixing a pound of ground beef with a cup of minute rice, diced onion, salt, pepper and garlic powder in a large bowl. Once the mixture was combined, she’d cut the tops off of four green bell peppers, hallow-out the seeds and then fill each pepper to the top with the mixture. Earlier today, I decided to try my hand at adapting this family recipe for a low-protein PKU diet and I was extremely pleased with how well this dish turned out! I substituted portabella mushrooms for the ground beef and instead of minute rice, I used Cambrooke Foods’s low-protein short grain rice. Here’s a closer look at the recipe and how I prepared it. To prepare the green bell peppers, slice the tops off and hallow-out the seeds. Place the caps back on top of the peppers and set aside in a dutch oven. In a large mixing bowl, combine portabella mushrooms, onion and imitation rice. Once ingredients are mixed, add ½ cup of tomato soup and stir until well coated. Add garlic powder, salt and pepper to taste. Using a large spoon, scoop mixture into each bell pepper until filling is level with the top of the pepper. Place the pepper cap on top of the now-stuffed pepper, use two toothpicks to secure the cap and place back inside the dutch oven. Repeat until all five peppers have been stuffed and re-capped. Pour the remaining condensed tomato soup in the dutch oven, filling in around the peppers until the peppers are at least half-way covered with the soup. Place lid on dutch oven and bake at 350° for 1 hour. * Based on 1.2 cup tomato soup mixed in with ingredients, not soup peppers are baked in. 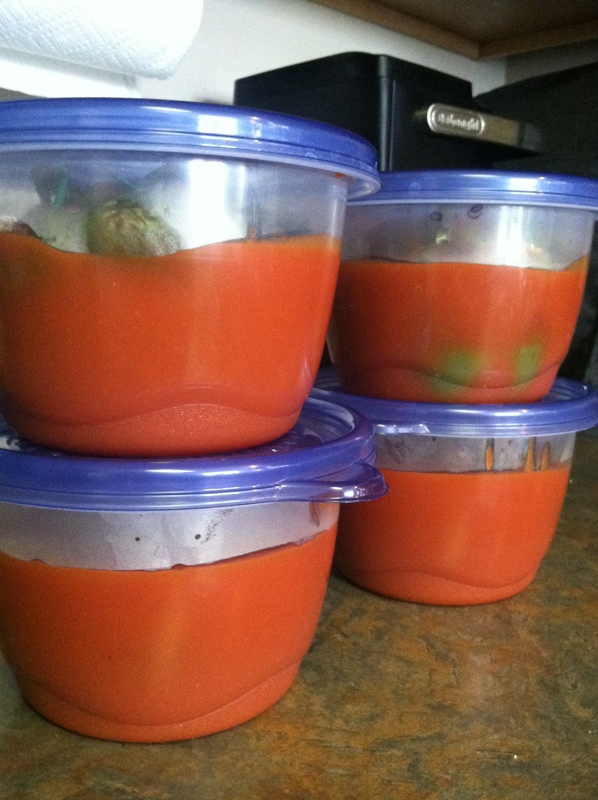 Invest in some plastic containers for storing extra servings in the refrigerator or freeze for later. As you can tell, this recipe makes a ton of leftovers. I ate one pepper immediately and packaged the rest in Tupperware containers. I placed two servings in the fridge for eating later this week (maybe as a packed lunch for work) and froze the other two so they wouldn’t go bad. If you feel like you need a little more sustenance, serve the pepper along with Aproten low-protein noodles and use the extra tomato soup as gravy. Just be sure to add 68 mg of phe per ½ cup of tomato soup you top it with. Returning to the PKU Diet—Easy Does It! Going from a completely liberated diet to one that consists of limited protein intake can be rather intimidating when you look at it from a 25,000-foot view. However, breaking-up the task in small chunks and tackling the goal with baby steps can make all the difference between success and failure. That’s the approach I’m taking after recently deciding to give the low-protein diet a try. I first started this effort last week by committing to taking my formula four times a day. I didn’t worry about altering my diet any; just made sure that I had 60 grams of protein via formula and see how that goes. 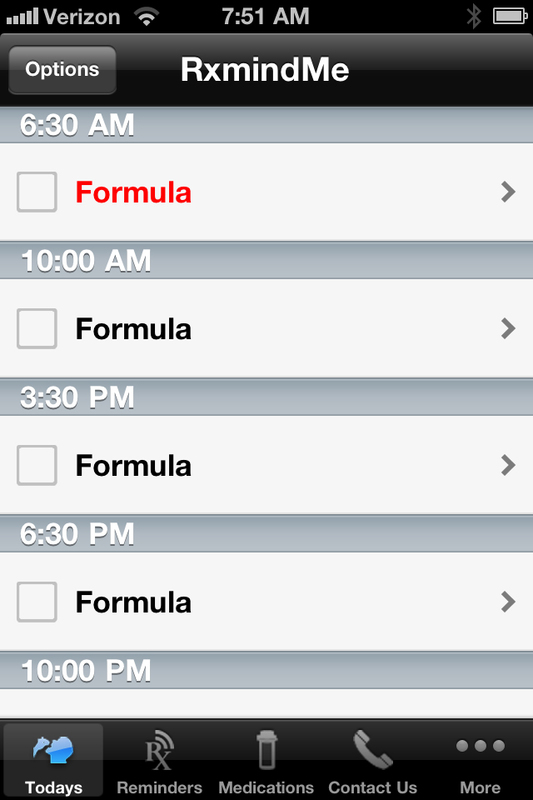 Use the RxmindMe app to set reminders on your phone to take your formula. For me, getting all the formula in was not a problem. I would take one with breakfast, the second at 10 a.m., a third near the end of the workday before heading to the gym, and the final before heading to bed. I even set reminders on my phone using RxmindMe and on my Outlook Calendar just in case I got caught-up with work and forgot to take a break for drinking my formula. After about the third day of doing this, I started to get really strong headaches, especially right after waking up in the morning. At first, I attributed them to stress at work, but when they persisted even on into the weekend, I figured there might be something else at play. Eventually, I concluded that by not altering my diet, but still consuming 60 grams of protein through formula, I was in essence consuming twice as much protein as a non-PKU person would normally eat. First time making Cook for Love’s low-protein bread! 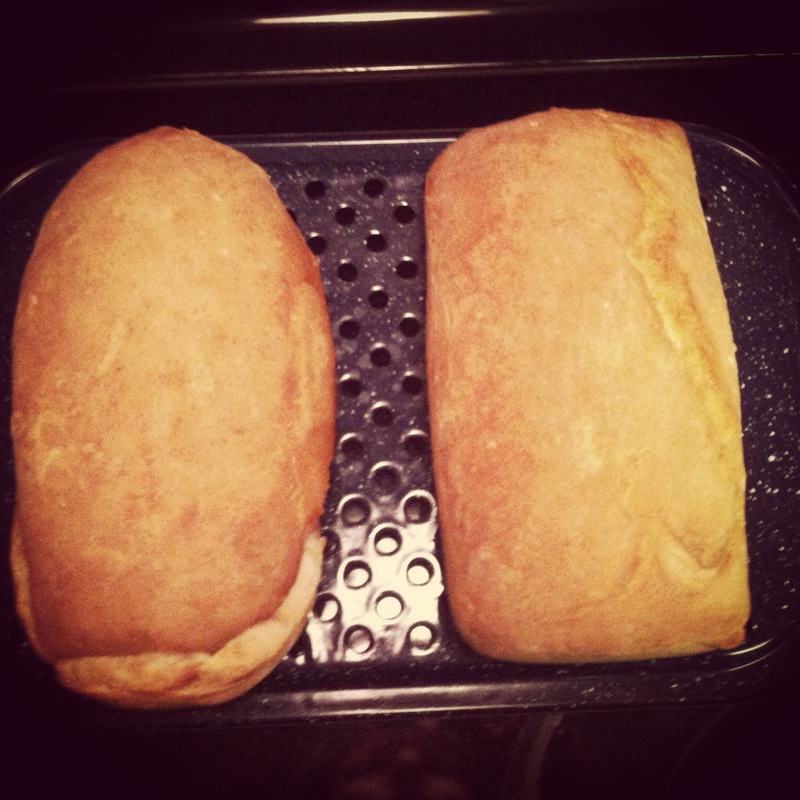 The 2nd loaf (on the right) definitely came out better. The next step in my goal of returning to the low-protein diet was to cut-out all meat. Given the persistent headaches though, I decided to ramp-up my progress. I decided to try my hand at making Cook for Love’s sandwich bread—in fact, I made two loaves and have frozen the second for eating later. I also started incorporating a few low-protein modified foods such as Aproten pasta and Cambrooke’s rice. That being said, I went from eating 60-90 grams of protein to just 15 grams as of yesterday. And the best part? No headaches when I woke this morning! I realize the real trick will be to continue this progress in the long term, but again, to keep from getting overwhelmed, you have to take it one day at a time. 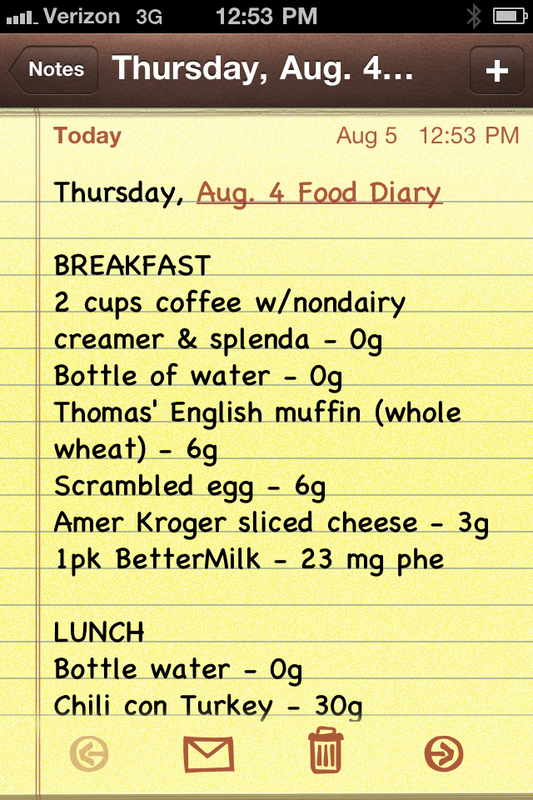 Today, I am going to work on building out my menu for the entire week. I’ll pick out some new recipes, search some free foods through Virginia Schuett’s Low Protein Food List and go from there. As I try new things or find tips to share, I’ll regularly post those here. Of course, if you have any to share, please feel free to do so in the comments section below. Here’s something you may not know when it comes to the business of distributing and paying for PKU formula. After trying the free sample of RESTORE LITE provided to me by Cambrooke Foods, I immediately connected with my clinic to have it added to my formula prescription. Apria Healthcare, which is the medical supply company that processes and ships my formula, called and told me, “We do not carry RESTORE LITE. We carry the regular RESTORE, but not the LITE.” After reporting this news back to my clinic, we decided to try Edgepark, a competitor of Apria Healthcare. What was Edgepark’s response? Not only does Edgepark not carry RESTORE LITE, they cannot carry the LITE because Apria, EdgePark and other “durable medical equipment” companies are reimbursed according to the number of calories in the formula. Call me crazy, but billing insurance carriers based on caloric value seems ridiculous, so while my dietician continues to search for an alternative medical supply company from which I can order my preferred formula, I decided to investigate this a little further. 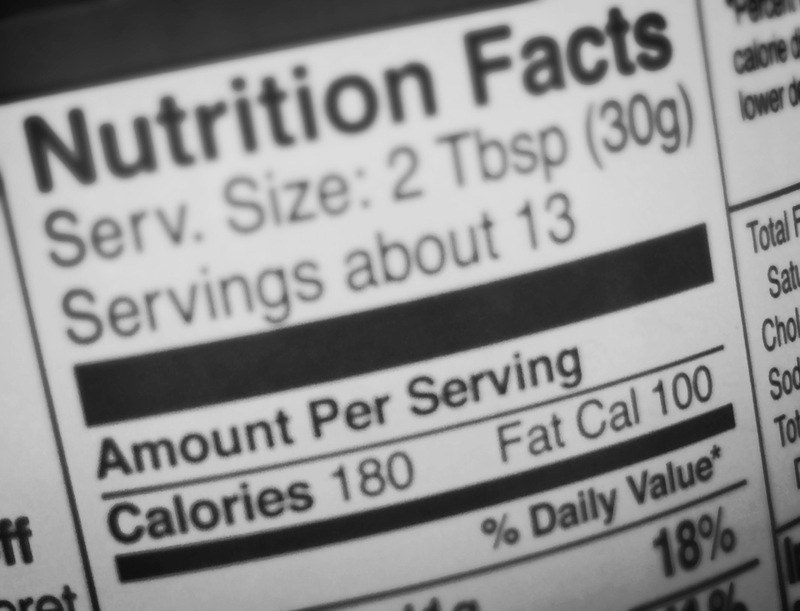 Enteral nutrition formula is billed in “units.” A unit is defined as 100 Calories. Sound all Greek to you? Well, it does to me too. It appears that billing formula based on calories is a government-mandated method, but why (if I am not on Medicare) does it apply to me? Do durable medical equipment supply companies decide to apply this method across the board since they are already required to do so for Medicare patients? And what does that mean on a personal level? Do PKU patients now have to decide whether eating healthier is worth what is likely a significant increase in cost? This way of thinking–whether it originates with the U.S. Government or with the medical supply companies–sounds all too familiar. For years, PKU patients have struggled with medical foods coverage based in large part on the incorrect assumption that a low-protein diet is cosmetic and only for achieving weight-loss. Despite calorie count, medical formula is medical formula. Period. If anyone from Cambrooke and/or Abbott Nutrition are reading this blog, I’d love to hear another perspective on this formula conundrum in the comment field below. Hopefully someone can explain why the 100-calorie difference you see between regular RESTORE and RESTORE LITE ultimately determines whether a patient in need receives their medical formula. To the untrained eye, this photo may seem like a magazine advertisement for Gatorade, but look a little closer and you’ll see that the innovative food scientists at Cambrooke Foods have out-done themselves again! Sports drinks like Gatorade are not restricted for PKU patients (unless they contain nutrasweet or aspartame), but what makes this new product unique is its dual functionality: part super-charged formula, packed with 10 grams of PKU-friendly protein, and part hydration beverage that contains critical electrolytes commonly lost during prolonged exercise. I requested a free sample from Cambrooke and tried the new product for myself. The lemon-lime flavor wasn’t too tart or harsh and the serving size was relatively large enough (16.9 fl oz) to quench your thirst after some pretty intense cardio. Contrary to what has been said on the PKU ListServ, I did not experience any grittiness in my sample. Since I knew that the product’s instructions required you to shake before drinking, I continued to shake the beverage while I was drinking it, especially if I put the lid back on and walked away from it for a moment. Despite any negative reviews the product has received, I believe PKU patients will really enjoy Cambrooke’s RESTORE and the convenience it brings to the low-protein diet. 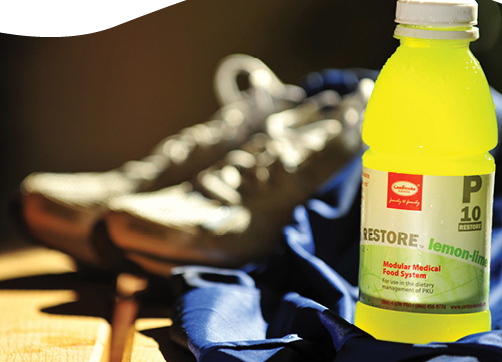 The sports drink does not require pre-measured water, blender bottles or any post-consumption dish washing activities. Just grab, shake, drink and toss—perfect for those individuals at the office, heading home from the gym, or even great for kids who don’t like to pack formula in their school lunch. In the future, Cambrooke plans to release additional flavors of RESTORE. If you’d like more information about the product or would like to know how to request your own sample, visit Cambrooke’s website. I give the product an A+ and will certainly be talking with my clinic about how to go about getting a supply. When BioMarin’s Kuvan was approved by the FDA in 2007 as the first prescription drug to treat phenylketonuria (PKU), directions for taking the prescription drug stipulated that a low-protein diet must also be followed. However, when I first discussed a Kuvan responder trial with my clinic in the fall of 2010, I was advised that I could remain on a non-restricted diet as long as I consume close to the same amount of protein each day. I suspect that this relaxation was granted with the understanding that if I do in fact respond to the drug, then lower phe levels are better than completely unbridled protein intake. They key; however, to making sure that you consume roughly the same amount of protein each day means keeping a very detailed food diary. Initially, I found it tricky to figure out a good method for capturing my daily protein intake. I explored the possibility of using Cambrooke’s DietWell app—a fabulous tool for the PKU community—but the more I experimented with it, the more I realized that the items that are truly high in protein are absent from its database. 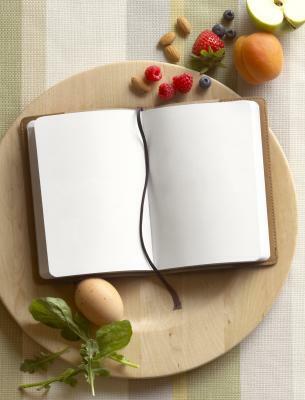 Take advantage of publicly available information—Obviously, checking a food product’s nutrition label is a great place to start when keeping a food diary. Be sure that the first thing you look at is the serving size because many products you buy in the grocery store will contain multiple servings per container. Use a weighted food scale, measuring cups or measuring spoons to gauge you portions. For times when not eating at home, try to plan ahead. Many restaurants list nutritional information on their Websites, have apps you can download to your mobile device or sometimes you can even ask your server for a printed brochure of nutritional information. Men’s Health—Whether it’s the New York Times Bestselling “Abs Diet” or the popular “Eat this, Not that” series, Men’s Health does an excellent job of providing all the information you ever possibly want on a food item. I especially like their recipes where we can cook healthy, in the comfort of our own home, and know exactly how much protein there is in a serving size. I’m sure other recipes, whether in a magazine or posted on a popular cooking website, will provide the same type of useful information. The Men’s Health product line has worked very well for me though. iPhone Notepad App—Lastly, because I am getting my protein equivalent information from a variety of sources, I decided to use my iPhone’s notepad application to track my meals. Even though this notepad app came standard on my iPhone, it has the mobile convenience of the DietWell app, but the flexibility of a blank page. I’m able to enter whatever food product I ate, total the daily protein amount, and when I’m done, forward the finished document directly to my email.